This story was written by Ken Barrett following his return from a visit to the Hurtgen Forest in May 2000. The primary reason for the trip was to visit the site where the remains of his Dad were found in April 1947, after being missing in action since November 16, 1944. The following is a description a trip to Belgium and Germany in May 2000. The trip was so special to me, I wanted to share it with others. My wife and I left for Europe in late May, and flew to London for one day. We took the train, through the "Chunnel" the following day to Brussels, where we rented a car and drove to Hey, Belgium, near Liege. We arrived on Friday, May 26, 2000. On Saturday, May 27th, we attended Memorial Day services at the Ardennes Military Cemetery near Nueville en Condroz Belgium where my Dad is buried. The weather was very cold and windy, with threatening rain all day. In spite of the weather, the Memorial Day services were nothing less than fantastic. The highlight of the service was the laying of wreaths (sponsored by various individuals and organizations from the area). The mayor of Nueville en Condroz sponsored a wreath and brought with her a group of school kids about 7-8 years of age. After the military escorts presented the wreath, the mayor brought a young boy and girl over to where we were sitting and the children shook our hand! Wow, what a moving moment. I almost "lost it". Another very moving moment was the playing of taps, complete with the standard F-16 flyover. This was followed by the Belgian and American national Anthems. Following the services, the Mayor invited all the Americans in attendance to a luncheon in honor of all the American and Belgian war dead. There were about 600 people in attendance. Americans invited, included dignitaries that participated in the Memorial Day service, such as the American Ambassador to Belgium, the U. S. General to NATO, the Secretary of the American Battle Monuments Commission and the President of the American Overseas Memorial Day Association. There were also a few family members invited whom had family members buried at Ardennes. The luncheon was quite a big deal, and lasted for several hours (we left after 3 hours). The Belgians really appreciate what the U. S. did for them during WW II, and they like to show that appreciation even today to those who have family buried in their homeland. I discovered that a local Belgian family had adopted my Dad's grave and that they place flowers at his gravesite on his birthday each year. We left Belgium on Sunday May 28, and drove to Germany, only about 3 hour drive. We stayed in a very nice hotel in the small town of Vossenack, which is in the middle of where the Battle of Hürtgen Forest was fought and was only about 2 miles from where my Dad was killed. My Dad was reported missing in action on November 16, 1944 but was not found until April 1947. His remains, along with those of 3 other American GI's, were discovered by a German woodcutter working in the area. The woodcutter contacted the American Graves Registration Service, who began the job of recovery and identification. The Graves Registration Service used a German interpreter, George Geist, who drew a map of the exact location where my Dad and the three other men were killed. That map ended up in my Dad's Individual Deceased Personnel File (IDPF). I obtained a copy of that map, along with other contents of the IDPF about 18 months ago, and as soon as I saw it, I knew that I had to try to go to that spot. I also knew that I could not find the spot without a guide, so I started looking for someone who knew the area, and possible also knew the history of the battle in the area. In the summer of 1999, I placed a note in the guest book of the 4th Division web page, asking if anyone knew of a guide or guide service that could go with us to the Hürtgen Forest. A couple of weeks later, I got a note from Asher Schroeder, from Iowa. Asher fought in the Battle of Hürtgen Forest and was assigned to the 4th Division, Combat Engineer's Battalion. In 1994, Asher had returned for the 50th anniversary of the battle and had used a German guide. The guide was Klaus Schulz, who had also fought in WW II and was captured and held as an American prisoner of war. 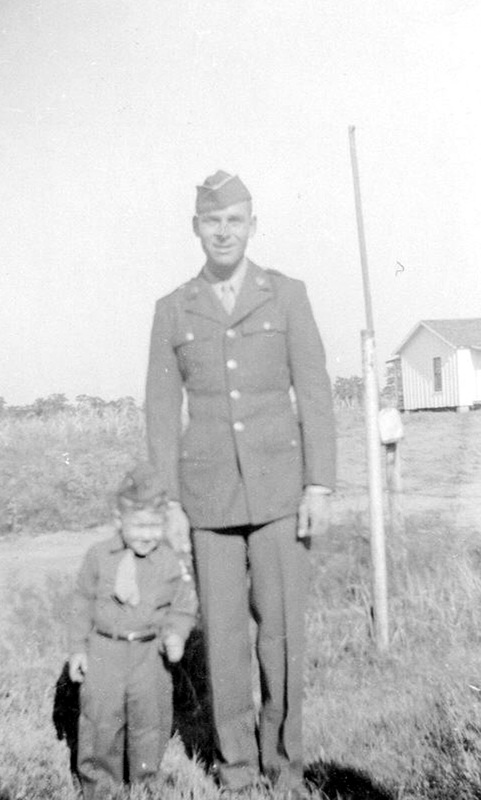 In November 1944, Asher Schroeder had been wounded and taken prisoner by the Germans. Klaus Schulz had worked in industry until he retired, and had always been a historian interested in the Battle of Hürtgen Forest. Following retirement, he often served as a guide for individuals and groups wanting to tour the Hürtgen Forest. Asher provided me with an address, telephone number and email address for Klaus. I quickly contacted Klaus and we began planning for a trip to Germany. We agreed to make the trip in early June and to tie this visit together with the Memorial Day services in Belgium. Through Asher, I also became acquainted with another person who had interest in the Battle of Hürtgen. Pete McCraren lives in Houston, and although he has no relatives that were involved with the battle, became interested in the Battle of Hürtgen Forest a few years ago. Pete is married to a German girl, and in a couple of trips to Germany spent time in the Hürtgen Forest, wandering around and visiting known battle areas. However, Pete had not had an opportunity to visit the area with someone who knew the area. As we visited, Pete indicated an interest in returning for a visit to Hürtgen Forest. In continuing conversations with Asher, he also indicated he would like to make another visit to Hürtgen before he got "too old" to travel (Asher entered the service when he was 19, so he is only a young 74 now). Through an organization called AWON (dedicated to assist WW II sons and daughters find information about their fathers) I also became acquainted with Jack Langston from South Carolina. Jack's father was also killed in the Battle of Hürtgen Forest. Jack's Dad was with the 28th Division, 110th Infantry, "B" Company. Jack's Dad was killed two days earlier and about a mile from where my Dad was killed. Interestingly, the same George Geist that the Graves Registration Service used in processing my Dad's case was also used in the case of Jack's Dad. I had sent to Klaus Schulz a copy of the map showing the location where my Dad's remains were found, including the name of George Geist. Klaus began a search for Mr. Geist as well as for the German woodcutter who discovered my Dad's remains. Klaus was not able to locate the woodcutter, but he was able to locate George Geist, and Mr. Geist agreed to accompany us to the site on our visit. When Jack Langston found out that Mr. Geist was going to accompany us, he decided that he and his brother Jerry would also like to join us on the trip. Jack and Jerry's Dad is also buried in Ardennes Military Cemetery, and they also decided to attend Memorial Day services. Jack was stationed in Germany in the late 1950's and had visited the Hürtgen Forest a couple of times, but had not been able to locate the site where his Dad was killed. Since that time, he also obtained the map that Mr. Geist drew and that was in his Dad's IDPF. Jack knew that with the help of Klaus and Mr. Geist, he and Jerry could also now go to the spot shown on the map. Throughout the process of planning the details of the trip, it became obvious to me that both Asher Schroeder and Pete McCraren were becoming increasingly more interested in going on the trip, but were afraid that they would be interfering with us and our trip plans. I contacted them both and invited them to join us. I could think of nothing better than to have someone like Asher, who actually was there at the time of the battle, along on this trip. It turns out that Asher was wounded and captured three days earlier and only a few hundred yards from where my dad was killed. It didn't take much persuasion to convince Asher and Pete to go with us. So the plan was now set; we all were to meet in Vossenack on Sunday night, May 28 to get an orientation from Klaus Schulz, our guide. We then would spend 1 day visiting the site where my Dad was killed, the site where Jack and Jerry's Dad was killed and the site where Asher was wounded and captured and 2 other days visiting historic sites of the Battle of Hürtgen Forest. That first day in the Hürtgen Forest, as we drove, then walked to the spot where my Dad was killed was a very emotional one for me. I spent time at that spot with Mr. Geist, who described what the area was like when he worked the case. I also spent a time with Asher asking questions about weather conditions, morale of the men, fighting conditions, etc. I stood there at that location and could only imagine what it must have been like for my Dad and the other men to be fighting this war, so far from home, in such horrible conditions, so young and I am sure so terribly frightened. It made me very proud of the bravery and willingness of my Dad and the others to give their lives in total dedication to our country. My Dad had only arrived to the Hürtgen Forest the previous day, and was a part of replacements for the 4th Division, 12th Infantry, and was assigned to Company "L". Oh how I wish we had more men like that today! The trip was the trip of a lifetime for me. For many years, I have wanted to know more about the situation surrounding my Dad's death. I never dreamed that I would one day stand at the spot where he lost his life. It was very special! As soon as we returned from our trip, I spent a couple of weeks putting together photos and video from the trip. It turned out to be a good project, and I was able to make copies of everything for all the others that went on the trip. I got to show the video of the Memorial Day services to my Mom, who was very pleased with it. I also made copies of all the video for my brother who couldn't go with us on the trip as well as for my uncle, my Dad's only remaining brother. I spent some time with my Mom getting her to talk about how she and Dad met, their early marriage up to the time my Dad went into the service. I now have that on video. I recently did the same with my uncle, about his memory of my Dad when they were kids. I will now probably try to put something down in writing, complete with pictures, that I can give to my kids so they can know something about their grandfather. Thank you for taking the time to read "My Story".